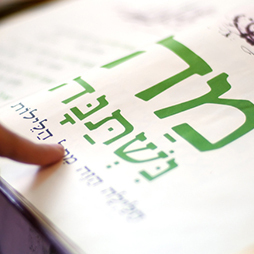 Hebrew is the gateway to Jewish literacy and fluency in prayer. It connects us to our history and present-day Israel. We encourage you as parents to take your children’s Religious School experience as your opportunity to learn to decode Hebrew or to brush up on your skills. We are here to help you! All third, fourth, fifth and sixth-grade students will be placed in classes based on their Hebrew ability. They will be evaluated at the start of each school year to see how well they have retained the material learned from the year before. At the end of the school year the students will be evaluated for mastering a selection of prayers in Hebrew, according to their respective Hebrew curriculum. Our Hebrew curriculum, Hebrew Through Movement is a language acquisition strategy in which students learn Hebrew by hearing and responding to Hebrew commands. This curriculum starts with a foundation in modern, spoken Hebrew. Its goal is to also make the prayers in our siddur, as well as synagogue and Jewish vocabulary, more easily accessible to those with limited learning time. Hebrew Through Movement (HTM) introduces Hebrew in a playful and meaningful way, creating a positive first link for children with Hebrew. • They learn by moving about and doing. • They learn in an environment of positive emotional support. • They learn when they feel safe from the embarrassment of not knowing. • They learn when they can move forward at their own pace. • They learn best when learning is joyful and playful. • They learn through songs, chants, and rhythmic activities. For students who want to concentrate their Religious School learning primarily on Hebrew proficiency, we offer this class on Sundays and Tuesdays to fourth, fifth and sixth graders. The class focuses on prayer, blessings and conversational Hebrew. 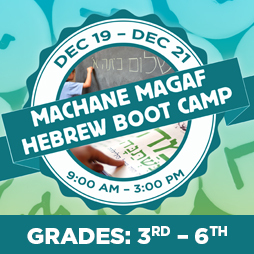 New in 2018, we are offering a three-day winter “Hebrew Boot Camp” December 19-21 from 9:00 a.m. to 3:00 p.m. for students in 3rd – 6th Grade. This camp style format will offer students fun games and activities all centered around becoming stronger Hebrew readers and learning Hebrew vocabulary. For more information, please contact Stephanie Schwartz stephanie@templeisaiah.com.